The Chicago Rock Island & Pacific, commonly known as the Rock Island (RI), was one of many railroads that linked Chicago the west. Now one of only a few diesel locomotives from the railroad in preservation has been completely restored by the volunteers at the Illinois Railway Museum (IRM). 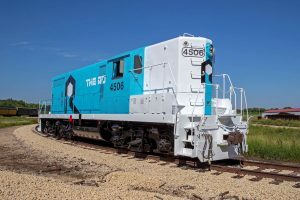 RI 4506, a GP7R type freight locomotive constructed in 1952, was turned out of the museum’s diesel shop in June 2018 in a fresh coat of blue and white paint and sporting the railroad’s final corporate image, a large block “R” and “THE ROCK” emblazoned across the side. It is the only piece of railroad equipment in any museum that has been restored to this 1975-vintage color scheme used by the RI. RI 4506 was constructed by the Electro-Motive Division (EMD) of General Motors in La Grange, Illinois in late 1952. Originally it was RI 1266 and was painted in a flashy red, black, and white color scheme. It was a GP7, the first type of “General Purpose” locomotive offered by EMD, and was one of roughly 2,600 locomotives of the type built for American railroads between 1949 and 1954. It operated in freight service on the Rock Island for more than 20 years. Around 1975 it was part of an agreement between the RI and a rebuilding company called Precision National whereby the rebuilding company purchased worn-out GP7 locomotives, rebuilt them as GP7R type locomotives, and leased them back to the RI. At this time the engine was rebuilt as a GP7R and became RI 4506, painted in the railroad’s new “The Rock” corporate image color scheme of blue and white. The Rock Island had entered bankruptcy in early 1975, which is when the new corporate image was created, but its fortunes only declined. In 1980 the railroad shut down completely and the GP7R rebuilt locomotives, including 4506, went back to Precision National. In early 1981, RI 4506 was sold to the Chicago & North Western and became C&NW 4160. It operated for the C&NW, and later Union Pacific, into the late 1990s. When acquired by IRM in 2007, C&NW 4160 was not operational and was intended to be stripped for parts and scrapped. But museum volunteers were able to get the engine running in 2008 and, given that it was the only ex-Rock Island diesel owned by the museum, the decision was made to preserve the locomotive and return it to RI colors. It was moved into the museum’s diesel shop in July 2017 and work on repainting the engine inside and out began. Painting work was completed in June 2018. The official unveiling of Rock Island 4506 will be on July 7th, 2018. The locomotive will be displayed at the East Union Depot starting at 10:00am and will go into revenue service pulling the museum’s passenger train after 11:00am.